Plato (ca. 427-347 B.C.) - Socrates' greatest student and a giant in his own right in the discipline of philosophy, Plato distinguished himself from his mentor, by writing...a lot. His works include the Socratic dialogues (which were likely his own dialogues that he attributes to Socrates), the Apology of Socrates, and his most famous work, the Republic. He also founded the Academy around 387 B.C., probably the first institution of higher learning in the Western world. It lasted until 83 B.C when it closed with the death of its final teacher, Philo of Larissa. Because of his writing, somewhat more is known about Plato than most of the other famous Greeks from this period. The exact year of his birth is not certain, but it was near the beginning of the Peloponnesian War. He came from an influential aristocratic family of moderate wealth. Sometime at a young age he came under the tutelage of Socrates and quickly displayed his own talent. After Socrates' trial and execution, Plato left Greece and traveled abroad, having visited Egypt, and the Greek colonies in Cyrene and Magna Graecia. It may have been during his travels to Egypt that he came across the story of Atlantis, which he records in the dialogues of Timaeus & Critias. This is the only surviving account of Atlantis and the source from which the legend derives. 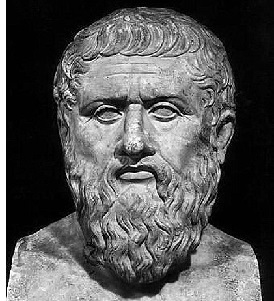 In the dialogues, Plato recounts the story of Solon "the lawgiver" (see Solon), who himself traveled to Egypt around 590 B.C.. Plato was a descendant of Solon through his mother. On his trip, Solon meets a priest of Sais who tells him the tale of the "Lost Continent of Atlantis". Although events have surely become exaggerated with time (or may be a composite of events), the origin of the Atlantis story if likely the volcanic eruption of Thera roughly a thousand years before the time of Plato (see Thera earlier on the Greek timeline). Jusr as the great philosopher Socrates was mentor to the great philosopher Plato, so also was Plato mentor to the great philosopher, Aristotle.